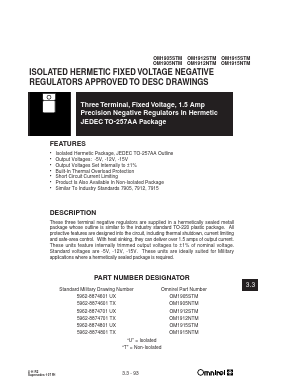 These three terminal negative regulators are supplied in a hermetically sealed metall package whose outline is similar to the industry standard TO-220 plastic package. All protective features are designed into the circuit, including thermal shutdown, current limiting and safe-area control. With heat sinking, they can deliver over 1.5 amps of output current. These units feature internally trimmed output voltages to Â±1% of nominal voltage. Standard voltages are -5V, -12V, -15V. These units are ideally suited for Military applications where a hermetically sealed package is required.